The village of Dervaig, standing at the end of the sea loch, Loch a'Chumhainn, is an attractive place. But it has one feature that makes it - quite literally - stand out. 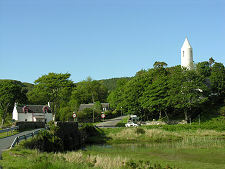 This is the pencil-shaped tower of Kilmore Church, Dervaig. This has become especially striking since the church was restored in 2004/5 and the century-old brown finish was exchanged for bright white harling. Because trees obscure the body of the church in distant views, the local joke is that the church was designed by NASA. But whatever the resemblances between Kilmore Church's white pointed tower and a vehicle destined for space, there is no denying that this is a remarkably beautiful church, and one whose beauty has really come to the fore since its restoration. And what is especially nice is to discover that this beauty is more than just skin-deep: it carries through to the interior of the building as well. 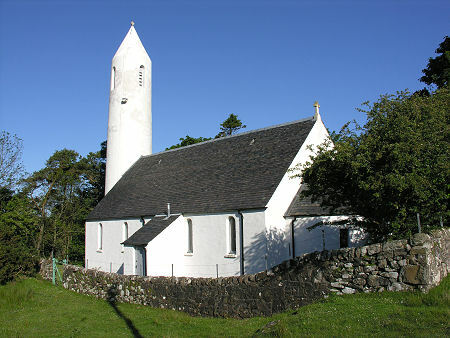 There had been a church serving the parish here since the 1200s, centuries before Dervaig's arrival as a planned village in 1799. 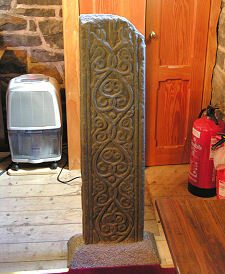 This was located in the graveyard a little out of Dervaig on the Tobermory road. It was later replaced by one standing on the site of today's church, but by the late 1800s it was being said that in bad weather parishioners could stay dryer outside the church than inside it, so thoughts turned to a replacement. 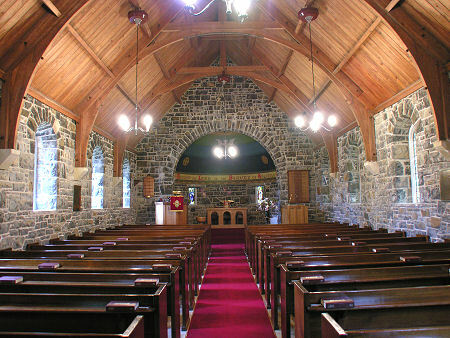 Kilmore Church, Dervaig, was designed in 1904 by the architect Peter MacGregor Chalmers and building work was complete by September 1905. Externally the design is a masterpiece of beauty and simplicity, which some have described as Romanesque, informed by the then very current Arts and Crafts Movement. 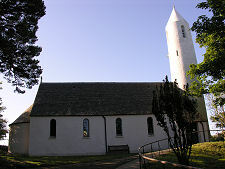 The design of the tower was based on Irish watchtowers such Cashel, Enniskillen, Clonmacnoise and Kilmacduagh, though here the tower was not free-standing, instead forming the west end of the church. 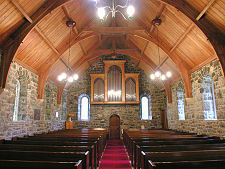 Internally the church is dominated by the wood colours of its ceiling and pews, and by the mix of grey and red stone blocks from which it is constructed. Actually, that's only half true. What really dominates the interior of Kilmore Church is the highly unusual apse at its east end. 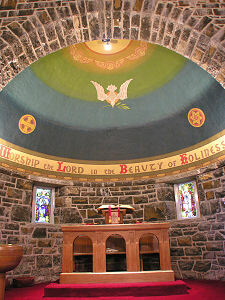 This is highly decorated and it initially caused more than a little local controversy, with one Elder resigned in protest at the idolatrous image painted on the apse ceiling. Today the apse serves the same function for the interior of the church as the tower does for the exterior: it adds a sense of beauty and originality that makes you sit up and take notice. The range and quality of the stained glass on show in Kilmore Church is especially impressive: all the more so since the renovation work of recent years. The windows were largely the work of Stephen Adam snr. who like the architect was based in Glasgow. 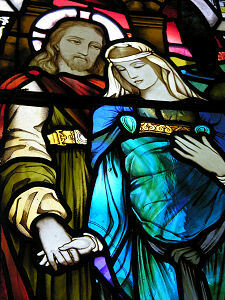 The stained glass commission for Kilmore Church was for five tall panels, and two smaller rectangular panels in the apse.